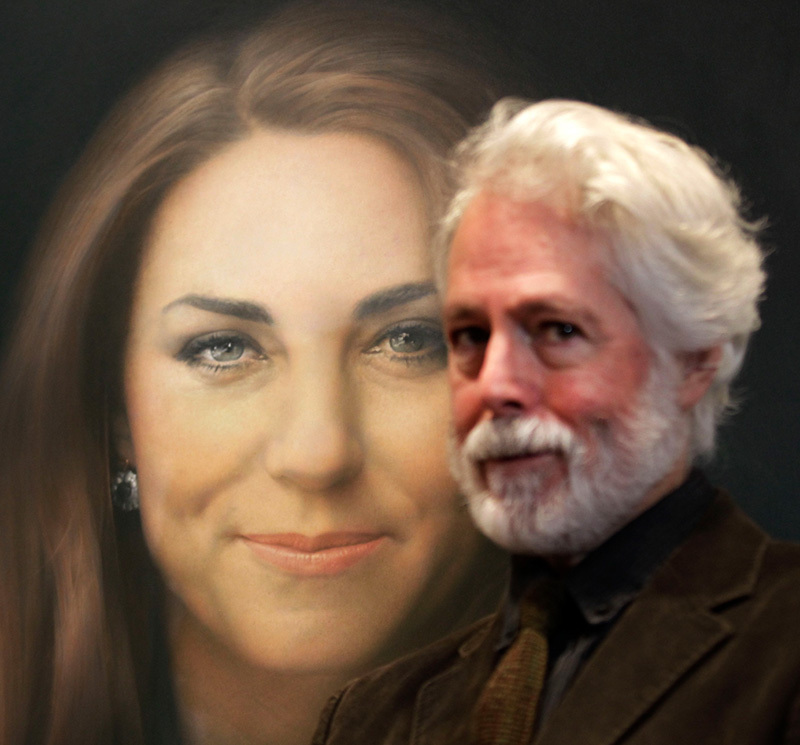 If It's Hip, It's Here (Archives): Kate Middleton's First Official Portrait Is Revealed To Mixed Reviews. Let's Take A Close Look. 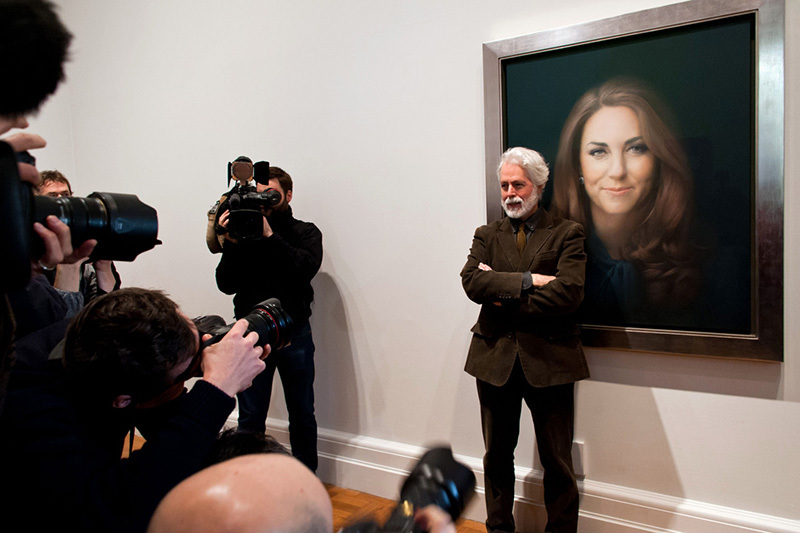 Kate Middleton's First Official Portrait Is Revealed To Mixed Reviews. Let's Take A Close Look. 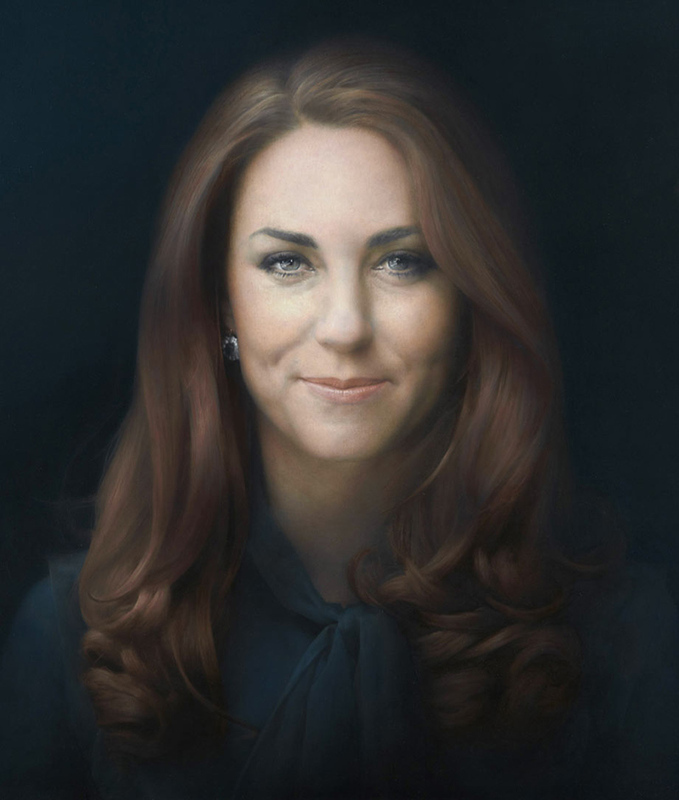 The Duchess of Cambridge's official portrait commissioned by the National Portrait Gallery in London was unveiled today. The oil painting, by South African-born artist Paul Emsley, was a result of two sittings and three and a half month's work (and painting from a photograph). 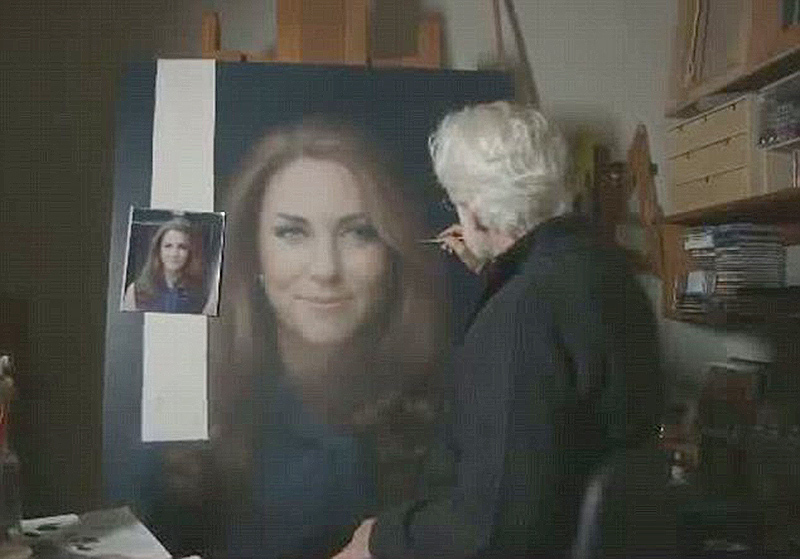 A frontal image of the 31 year old Kate's head, the painting is being criticized globally for prematurely aging the wife of the The Prince of Wales. 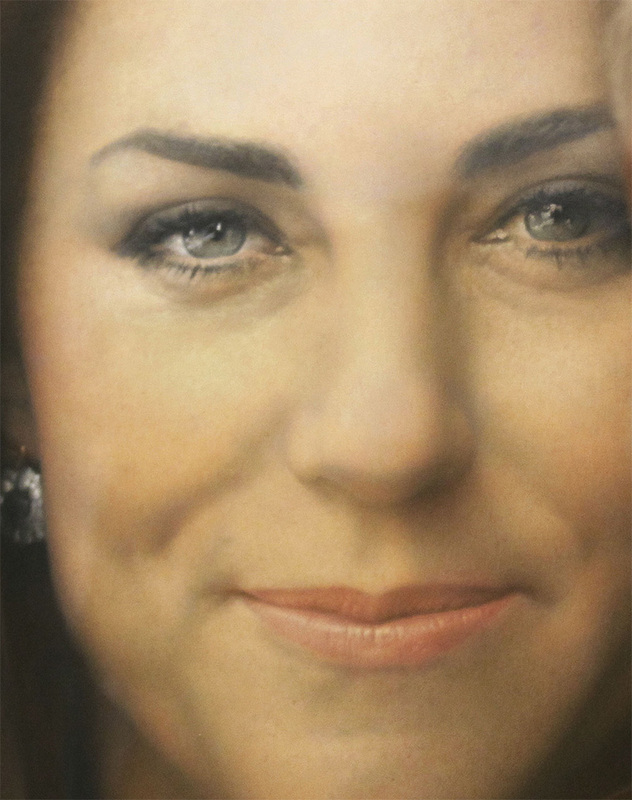 Several art critics are pointing out the fact that the painting includes bags beneath her eyes, deep lines around her mouth, a pale pallor and gives the Duchess a large nose. In the side by side comparison above, it seems that the artist created a very competent likeness, only in reality, her eyes seem a tad larger, her actual nose is smaller and less rounded and she has far more red in her skin tone than the painting suggests. That said, in my personal opinion, some of the critics are correct. The artist says he altered the color of her eyes to match her blouse (a silk teal shirt with a bow at the neck) and background. Kate is wearing the sapphire diamond earrings that were said to be fashioned from a pair of Diana's in the portrait. The Duchess of Cambridge, 31, said that she wanted "to be portrayed naturally — her natural self — as opposed to her official self," Emsley said in the New York Daily News. I'm not a fan. The portrait makes her look at least a decade older. I don't see a problem. It looks just like her. She's not a teenager. Anyone else see the artist's reflection in her left pupil? I like it. I also think that the portrait will remain close to what she looks like for a while. It manages to be both flattering and honest. A lot of the comments seem to be complaining that the portrait doesn't show her nice smile. Well, it's hard to maintain a genuine smile if you're sitting for a portrait, and there are lots of smiley pictures in gossip magazines, if that's all you want. I think it looks just like her. She's actually not that pretty. How can anyone deny that it's her. It looks as though he actually softened some of her harder features. I absolutely see it, but nobody else seems to be talking about it. I also see the artist's image in her left eye. That's wild...never saw it until looking at these enlargements. It's a true likeness. She's not soft or particularly pretty - she's hard, steely eyed, smug, determined and ambitious. In this photo she's staring at us, victorious: she's got the ring and the title and she's darn pleased with herself. 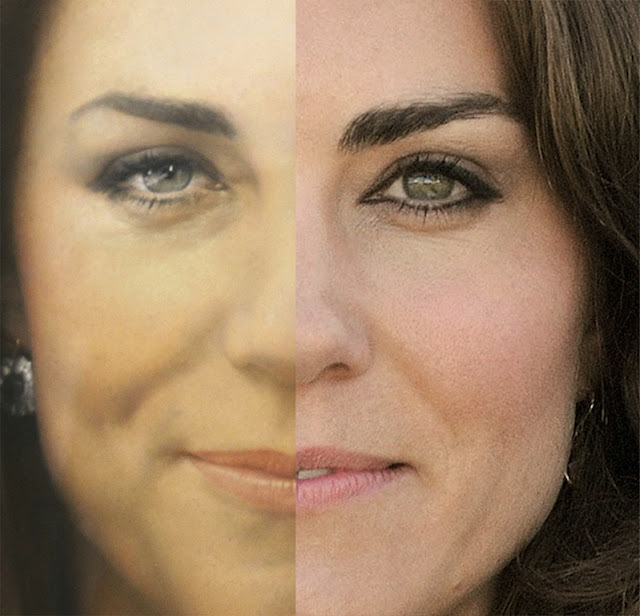 And the side-by-side comparison shows that he painted her as she is, warts and all. Artists don't photoshop. Emsley's done a fantastic job and he's captured her true essence. Just because she's not looking girlish or innocent and just because she's not photoshopped doesn't mean he's a bad painter. No way did he deserve the public backlash. I don't know who she is (well I do now, but as a Swede it's not someone I would know of). But as far as the portrait goes it's as good as a bad retouch job in photoshop. An believe me I know about those since I work in the business. The softening is a big problem since it doesn't add beauty it just steals it and leaves her look bloated (even though the artist must think otherwise). Her nose looks nothing like it does in the original picture. From a person that knows a bit too much about how the magazines and fashion industry works this is almost as bad as their worst jobs.
. She is beautiful and he aged her. The bags under her eyes, the round nose. Her cheeks look like they have muscular dimples. Absolutely ridiculous for a royal portrait. I'm astonished to realise that she looks older mainly because she looks like wearing heavy make-up. The fact that her skin appears smooth, without wrinkles, makes her look like one of those mature women that insist on creams and powders to look younger, thus appearing like NEEDING to look younger. beware of make-up and creams (including hydrating, exfoliating, cleansing, serums...). The more you use that stuff to look younger, the older you look! She looks older and less cheerful in the portrait, definitely. What's the antonym of "flattering", "insulting"? For this sort of thing, the artist should err in favour of the subject, not against her. They eyes should be at least as large as they really are, her expression should be at least as joyful, and her wrinkles and lines at most as what they are, not emphasized. But the again, that's his style. This artist appears to flourish on painting the old and decrepit, using the lines and wrinkles to bring out the life in his paintings. That's his style; he's undoubtedly a good artist; he was just the wrong artist for the job. It's the person who chose him for the job that made the mistake, not the artist. Whether one likes the painting or not, for, as portraits go, it's always subjective, and subject to the artist's personal view and talent - this one obviously reflects this particular artist's style - this is a pretty picture, but, it is not a complementary likeness of the subject, and thus not appropriate to be the official portrait. Shame on the Royal Family for not having the integrity to be forthright and reject it.